Select an option Grey Black Tan Brown Off-white For a Girl! For a Boy! Surprise me! 1. What color teddy bear do you want? 2. What colors you'd like the pillow and blanket to be. If the above questions are not answered I will decide for you. Cheers! And thanks for shopping. Hanky Fanny, Get You One! 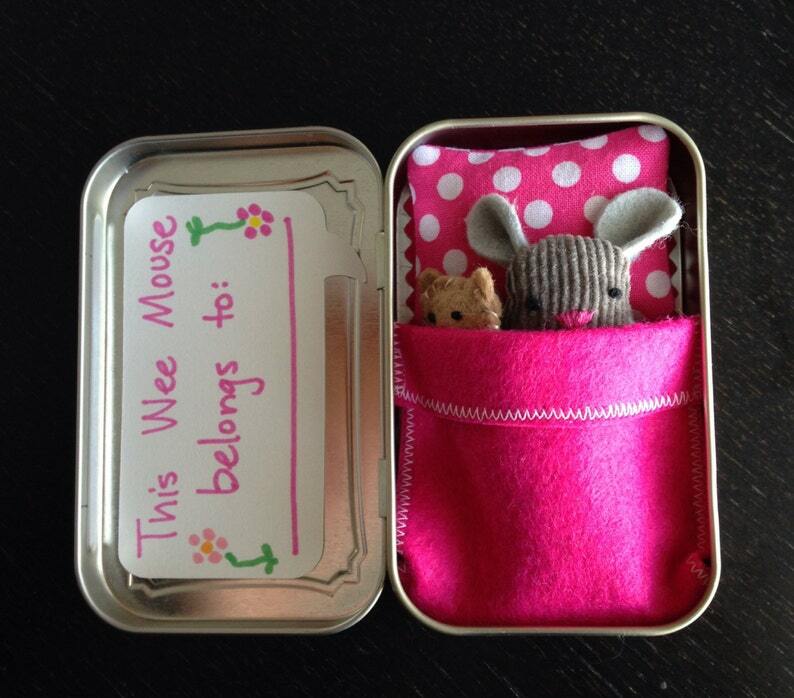 Very cute mouse. I’m sure my nice will love it. Delivery was slower than I expected. This is such a cute item, great quality, my daughter totally loves it. These are so cute! My kids LOVE them and will be awesome toys for them to play with on our road trip! thank you so much! You can paypal me, send me a check or money order, or pay with a credit/debit card. If you send me a check, I will deposit it within one to two days of receiving it and wait until it clears. I will then send your item when it's ready. Items paid with paypal, money orders, credit or debit card will be sent within 2-4 business days, unless they are custom orders. Custom orders take one to three weeks to complete, depending upon item ordered. If you decide you do not want your item before I ship, please let me know. Otherwise, I will refund your money minus the shipping if the item is in the same condition it was sent. Please see the Refund Policy for more information. If you are unhappy with your product, please send it back in the same condition it was sent. I will refund your money minus the shipping costs. I ship first class insured, so if your package is damaged or lost, please let me know and we will take the necessary action to get a refund. Otherwise, I am, unfortunately, not responsible for all other damages or losses. Custom orders are not returnable for obvious reasons. If you are unhappy with the product, I will do everything I can to make it better. However, do realize once a product is made, there is not much I can do without almost completely starting over. Thank you for understanding this policy. If you wish to cancel an order, please do so as soon as possible. Please make note of shipping times if you need an item at a certain time. I usually ship close to the latter shipping date. If the item is not a custom order I will offer a full refund. I send all items USPS first class mail insured. Please let me know if you'd like an upgrade and I'll change the shipping to reflect that. If your package is returned for any reason, I will verify shipping address and resend after payment for another shipping label. Please make sure your address is correct. I am not responsible for incorrect address. I will use the address you provide me. If you are in countries other than the US and Canada and would like to order sown thing, please let me know. I am happy to ship to you after shipping prices have been determined! If you see something here that you like but want in a different color or style, just ask, I'm open to custom orders of anything I make!